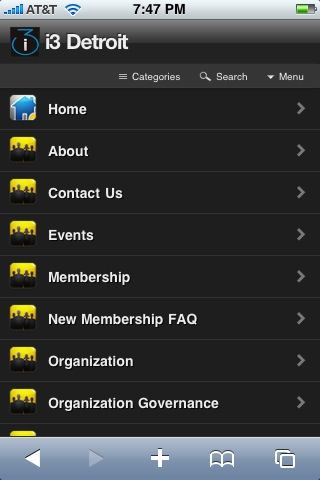 We have just completed optimizing the i3 Detroit website for optimal viewing on your iphones & ipod touches. 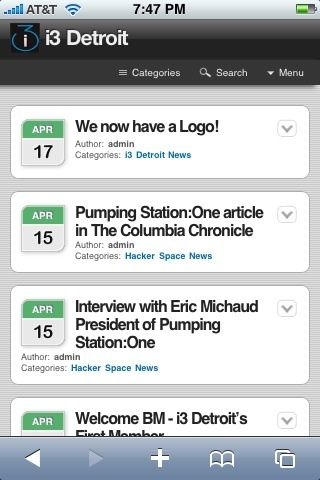 When you browse to www.i3detroit.com from your iphone or ipod touch you will automatically be viewing the site in it’s mobile view. You still have the ability to view the site in the normal browsing view by turning of the mobile theme option at the bottom of the home page. Please give us feedback of your likes and dislikes as well as any problems you may have. We now have a Logo! I would like to give a big thanks to Eugene over at logodesigncreation.com for all of his hard work on designing our new logo. I feel that the new logo represents our organization very well. I am interested in hearing all of your thoughts on the new logo. Feel free to leave a comment. https://www.i3detroit.org/wp-content/uploads/2014/03/Logo_large_png8-300x98.png 0 0 admin https://www.i3detroit.org/wp-content/uploads/2014/03/Logo_large_png8-300x98.png admin2009-04-17 18:30:292009-04-17 18:30:29We now have a Logo! Eric Minsker over at The Columbia Chronicle did a great article about Chicago’s very own Pumping Station:One back in March. I wanted to share this article with everyone as i feel this helps to define i3 Detroit’s own goals. Here is an interview with the President of Pumping Station: One that i feel defines the idea’s behind building a Hacker Space. HELLO – Eric Michaud, President of Pumping Station: One from Dave Jacob Hoffman on Vimeo. i3 Detroit officially now has 2 members. BM was the first to contact me to become a founding member. I am looking forward to working with BM.